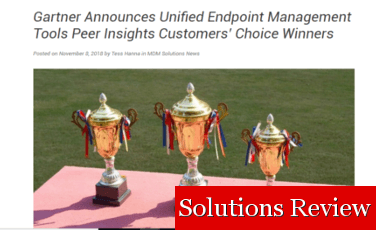 42Gears is named as one of the 2018 Unified Endpoint Management Peer Insights Customers’ Choice winners. 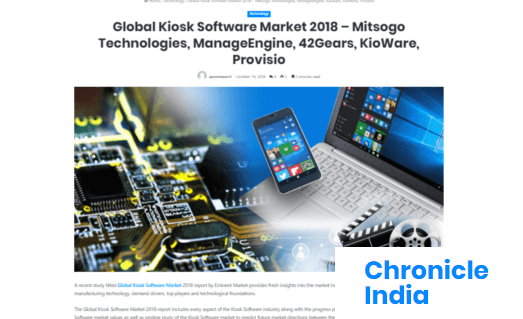 The latest Global Kiosk Software Market 2018 Report includes 42Gears's Kiosk Software as one of the dominant players of Kiosk Software industry. 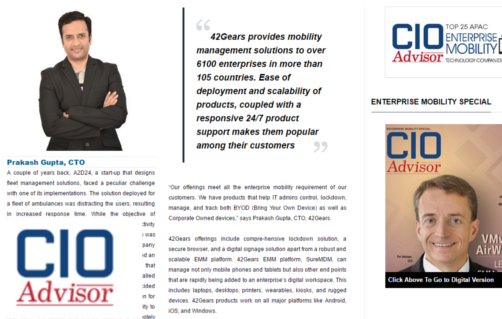 Bulwark is one of the Value-Added Distributors to distribute 42Gears Enterprise Mobility Solutions & Services in the Middle East. 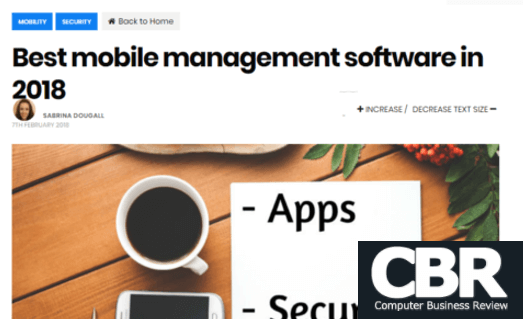 42Gears is listed as one of CBR’s top recommended MDM software options for 2018. 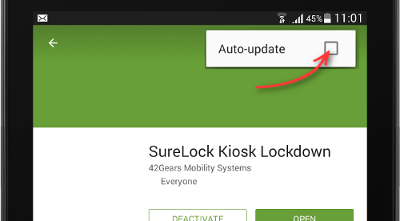 Read how 42Gears preempts the gaps around the security, monitoring, and management of these devices running on different operating systems. 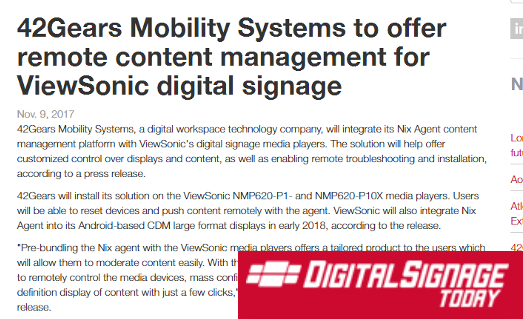 Read how integration of SureMDM Nix Agent with ViewSonic's digital signage media players has helped ViewSonic to offer customized control over displays and content, as well as enabling remote troubleshooting and installation. 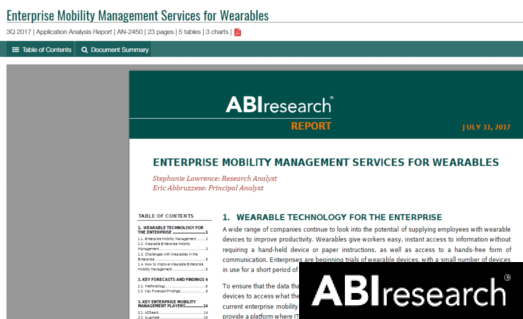 ABI Research Report mentions 42Gears as a key EMM player in Enterprise Mobility Management Services For Wearables Report. 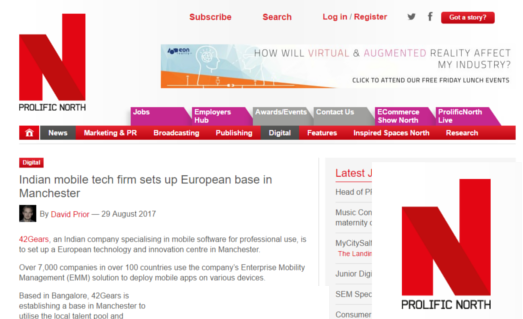 42Gears, an Indian company specialising in mobile software for professional use, is to set up a European technology and innovation centre in Manchester. 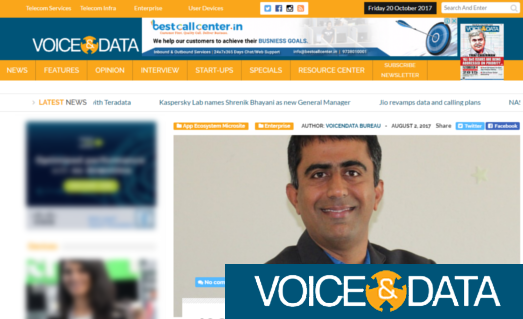 Onkar Singh, Founder and CEO of 42Gears talks about the company's journey and how restricting cellular data usage and lockdown of mobile devices is a must in growing enterprises. 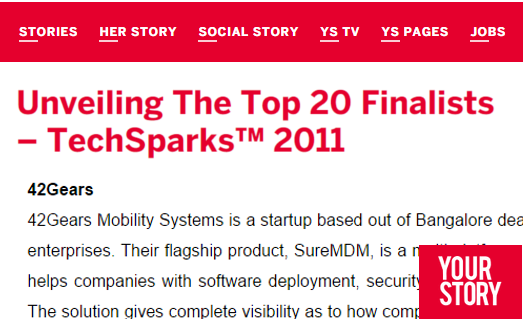 42Gears is among top 25 APAC Enterprise Mobility Technology Companies 2017 for exhibiting excellence in delivering Enterprise Mobility solutions for the Asia-Pacific region. Silicon India features 42Gears in its Top 50 Fastest Growing Companies in India list for 2017. 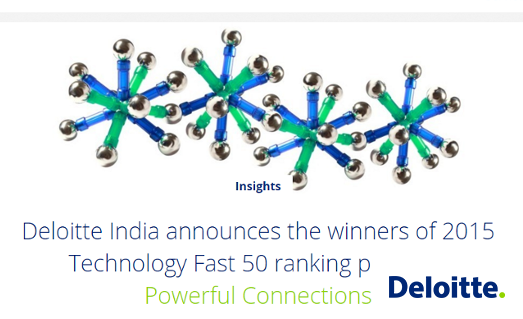 42Gears is one of the 13 Companies stepping up as 2nd time winners in Deloitte's Fast50 India. 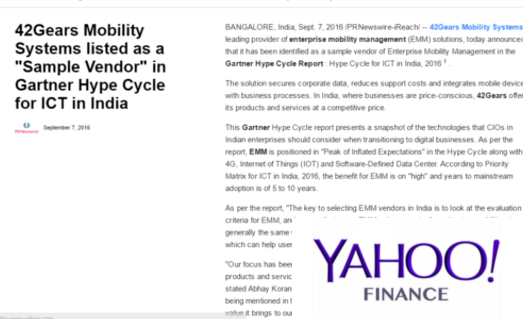 42Gears Mobility Systems is identified as a sample vendor of Enterprise Mobility Management in the latest Gartner Hype Cycle Report : Hype Cycle for ICT in India, 2016. Email us for the report. 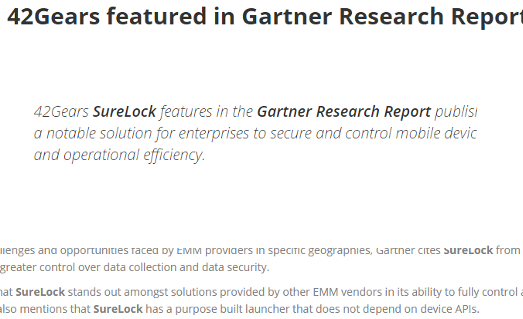 42Gears SureLock features in Gartner Research Report published in April 2016 as a notable solution for enterprises to secure and control mobile devices for manageability and operational efficiency. 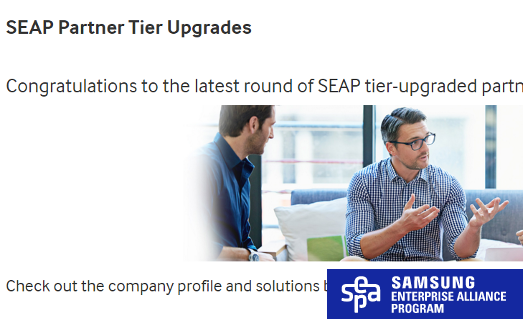 42Gears is now Samsung Enterprise Alliance Program (SEAP) Gold Partner, a recognition for outstanding business results when working with Samsung. The Rees Hotel Queenstown picks SureFox from 42Gears to secure tablets deployed in guest rooms. 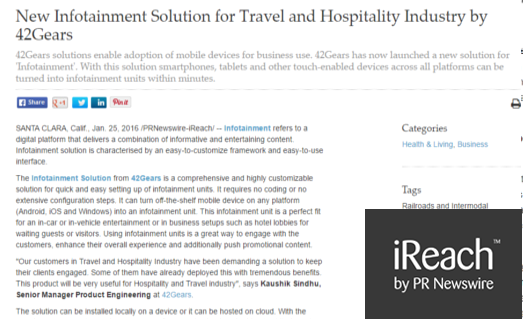 42Gears launches a new solution for 'Infotainment'. 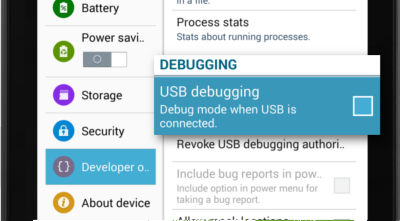 With this solution, smartphones, tablets and other touch-enabled devices across all platforms can be turned into infotainment units within minutes. 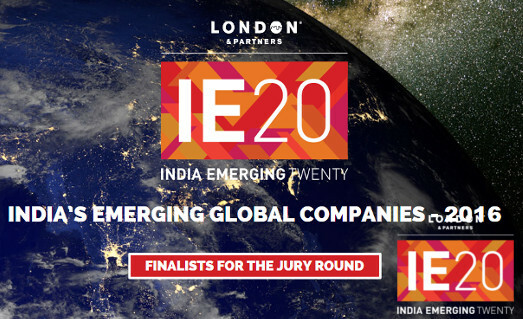 42Gears is one among the top 20 finalists for India Emerging Twenty 2016. 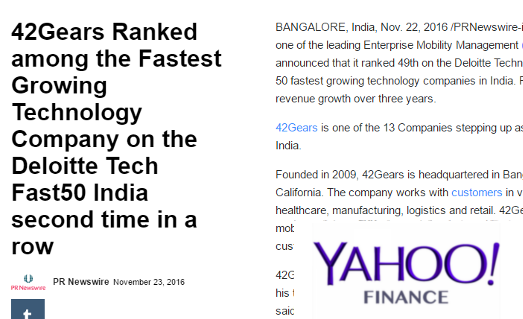 Based on percentage revenue growth over three years of 378%, 42Gears was ranked among the 50 fastest growing technology companies in India. 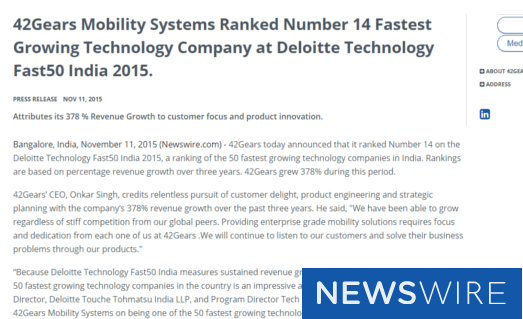 42Gears ranked 14th among top 50 fastest growing technology companies in India. 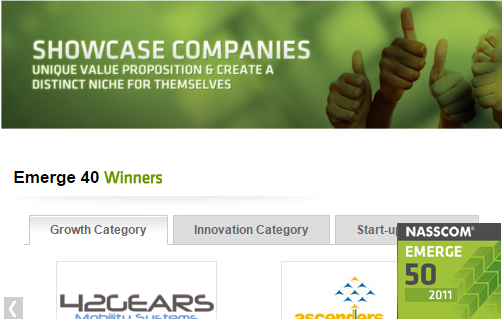 42Gears is listed among top 5 bootstrapped startup companies in India. 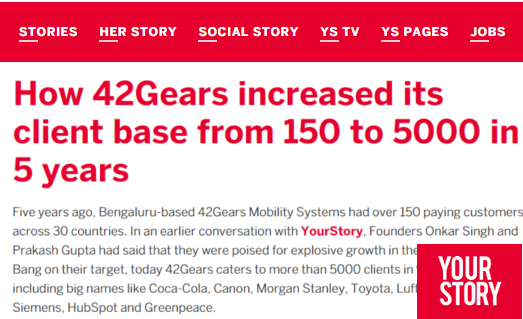 How 42Gears increased its client base from 150 to 5000 in 5 years. Put Focus And Passion In Anything That You Do - Onkar Singh, CEO, 42Gears. 42Gears: A Culture of Innovation & Fulfilment with Mobility. 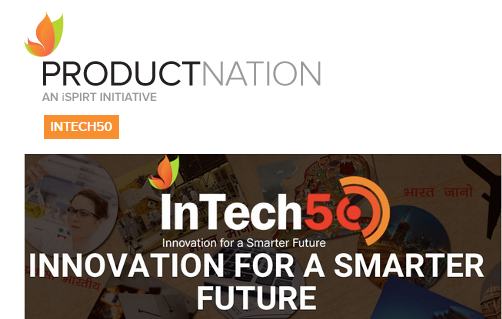 42Gears among top 50 companies at InTech50 2015 (a flagship event of iSPIRT & Terenne Global). NASSCOM Emerge 50 Awards are result of a year-long search for India’s Most Innovative top 50 emerging software product-centric companies. 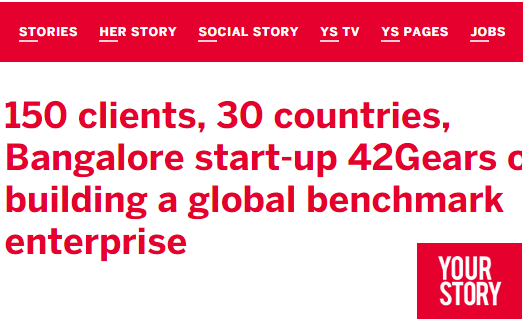 150 clients, 30 countries, Bangalore start-up 42Gears on building a global benchmark enterprise. 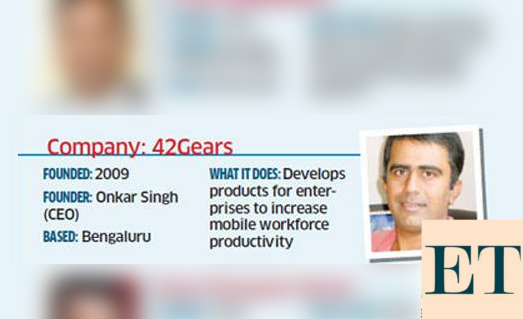 42Gears listed among 20 most innovative companies being built out of India for the year 2011.